Aladdin, the press launch. 15th February 2016. In true Disney style, this event began with a long queue outside the stage door of the Lyceum Theatre (currently home to Disney long-runner “The Lion King.”) The atmosphere was anticipatory, as ever the “magic of Disney” coalescing even before the experience began. A charming welcome at the “check in” desk, and then, well, through the wings (“Lion King” props neatly stored everywhere) and on to the massive stage of the theatre itself. Here, Disney showed just how much attention it pays to theming and production values. Two hundred chairs, space for photographers at the back. A gallery of show illustrations on the wall behind. At the front, in the proscenium opening, a giant projection screen (behind which we could just see the vast auditorium) surrounded by its own custom “Aladdin” proscenium arch, and flanked by display groups of lavish show costumes. Oh, and a piano. We could already have been in one of the parks, waiting for a show to begin – though I don’t recall attractive hosts circulating with nicely chilled flutes of Prosecco and orange juice pre-show in California’s Disneyland. Scene set, our host, none other than Thomas Schumacher, President and Producer for Disney Theatrical, opened proceedings. An on-screen run through the creative team (including our own Tim ‘Mickey Mouse’ Rice – you had to be there), and history of both Disney Theatrical and the show to date, plus the interesting fact the story itself came from a French translator embellishing “1001 Nights,” was followed by the first live performance of the evening. 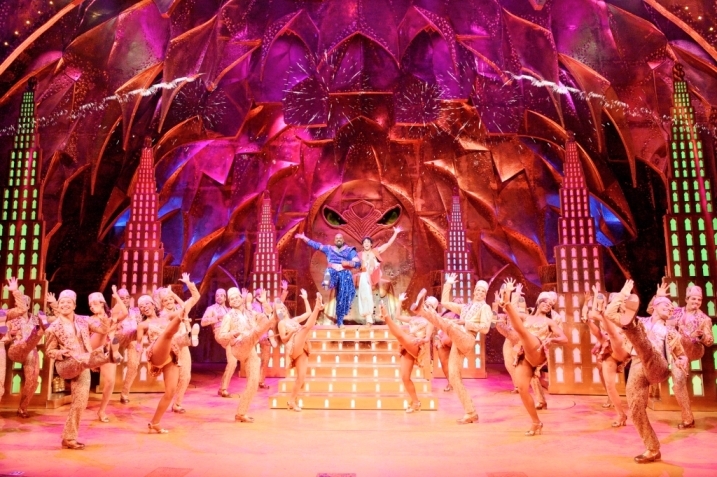 Jade Ewen and Dean John-Wilson, Aladdin and Jasmine in London (pictured above, photographed by Helen Maybanks), demonstrated effortlessly that the show’s casting director knows a thing or two. Rehearsals have not even started for the June opening at the Prince Edward Theatre, yet already this pairing have all the charm and charisma between them to ‘stop the show’ with “A Whole New World.” Crystal-clear that they will create a new horizon in West End couples come opening night. How they will be doing that is even more exciting, as designer Bob Crowley talked us through (and gave a brief video glimpse) of the flying carpet they will be performing on. A fan of magic, even I let out an involuntary gasp at the genius of the effect. Add sets and special effects among the most impressive ever used in London, and you can see why Schumacher’s jokes about the budget had just a tinge of concern. Still, Dean John-Wilson reassured us with his second performance, “Proud of Your Boy,” and proved that a change of lighting (recalculant bulb, now fired from showbiz) couldn’t worry him a jot. Back to spending on the show, (above, showing James Monroe Iglehart, Adam Jacobs and Broadway Company, Photographed by Deen van Meer) and at this moment, 352 people (25 shoe makers alone) in 28 different shops from the Isle of Wight to Manchester are creating 370 costumes. 3000 crystals on one piece, and did you know that dance heels have to be wider than the scenery tracks on stage, so they don’t jam between the rails? Since one dance number will need 108 cast changes in a minute, that makes sense for everyone to be able to move fast and safely. 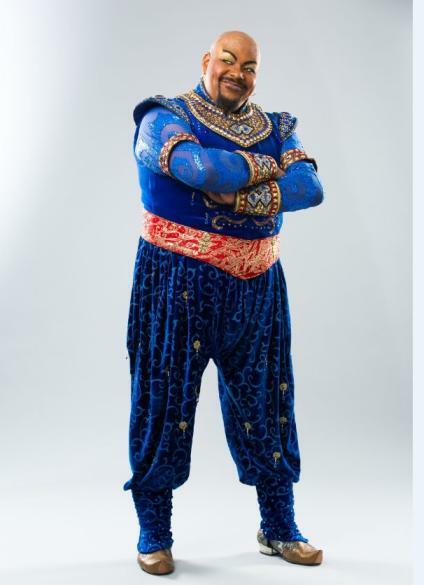 Marvelling, it was time for the Genie, Trevor Dion Nicholas (pictured above) to appear. The star of the Broadway production is so keen to open the show in the West End, that he is moving his entire family over for the run. A unique rendition of “Friend Like Me” arranged for piano rather than the massive production number, almost closed a memorable event. With just time for a montage of images, it was time to head off (to see another show, for me, in fact) and hope that there would still be tickets available for “Aladdin” when pay day rolls around. Interestingly, the fans of the 1992 film are now in their 30s, and massive supporters of this stage version, which Disney do aim at an audience older than that of the animated feature. Their policy of “we don’t do “film to stage transfers,” we simply adapt musicals for the stage,” allows this flexibility, and this has already proved a record-breaking formula on Broadway. Having attended this event, and going on my own instinct, I would say seriously that this is one theatrical event of 2016 that nobody will want to miss. ← Small Shows are Best. I’ve seen the show on Broadway and it really is incredible. I know where those almighty costume changes come in and your jaw will drop. Trevor Dion-Nicholas is a spectacular Genie – I saw him cover for James when I went to NYC last September – I can’t wait for UK audiences to be wowed by him! Finally, I am seeing the show on 27th May on its preview night as I couldn’t pass up the opportunity to see the first performance in the UK! Thanks for this blog post Theatre Moneky – I am also truly jealous. Only just seen your post Zoe – no idea why the system didn’t send me an email to approve immediately! It looks amazing, and this UK audience person has already been wowed by Mr D_N. Equally jealous you’ve seen it on Broadway LOL.